Next to my review of Visual Website Optimizer, I’m also giving away 5 licenses. Read more on how to compete at the end of this article. But first things first, the review of Visual Website Optimizer. In all honesty, I think they are spot on. With the help of a point-and-click editor, called the Visual Designer, setting up test variations is done in a matter of seconds. Along with a clean and sleek user interface, Visual Website Optimizer is a full A/B testing package used by many big companies throughout the world. 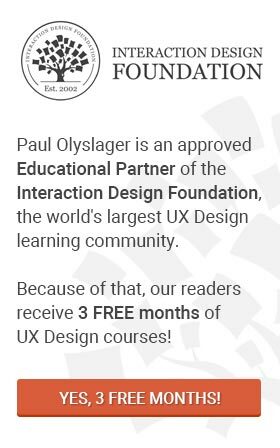 Heck, even I use it to improve my conversions on the UX Book Collection article. In A/B Testing you create two (or more) different versions of your website or landing page. Then you split your traffic amongst those versions to analyze which one gets maximum conversion rate or sales. The winning version of the website is later chosen to be implemented permanently. In Multivariate Testing you select different elements on your website or landing page (such as headlines, images, buttons, etc). Different versions of selected elements are created and combined. Then you split your traffic amongst those combinations to analyze which one gets maximum conversion rate or sales. Split URL testing is similar to A/B testing, the only difference in Visual Website Optimizer between the two is that in A/B testing variations of the page are created using the visual designer. However, for Split URL testing, as the name says, you have to create and host different versions yourself on different URLs. VWO provides a superior visitor segmentation engine, which allows you to run tests only for visitors who qualify your segment. Segmentation is based on campaign ID, referring URL, cookie value, visitor type etc. Usability testing is a precursor to A/B testing where you actually seek qualitative feedback from users. You show them your website or landing page, and then ask them questions such as “Do you like the design of the page?”, “What is your understanding of this page”, or “Please provide 3 dislikes”. Usability testing helps you discover usability flaws, come up improvement ideas and also provides you with interesting insights, which you can A/B test. If you want to measure how your website is performing, you can use Visual Website Optimizer to track various conversion goals. You can measure these goals independently of creating any A/B test. Heatmaps visualises the spots where users are clicking and where they are not, by grouping the clicks into red areas (highly clicked on) or blue/black areas (never clicked on). Clickmaps, on the other hand, give you exact click statistics on anchor tags. Although these two are nice additions to the collection of VWO, I’m still not sure on how to make these actionable. Because of its many great features, ease-of-use and clear and live reports, Visual Website Optimizer is one of the best testing tools on the market. VWO is very easy to install. The tracking code, both asynchronous and synchronous, is generated by VWO. If you are using WordPress, simply download their plugin. Visual Website Optimizer has its own split testing blog, where you can find numerous interesting case studies. Although some of VWO’s direct competitors, such as Unbounce and Optimizely, have cheaper monthly subscription plans, Visual Website Optimizer is worth every dollar. I did find a few minor bugs in the Visual Designer (which didn’t had any effect on the live test) but Wingify Support helped me out in matter of minutes. I recommend this tool to anyone who is trying to increase conversion rate and boost sales on their website. Aside from the review, I’m also giving away 5 licenses of VWO. Competing is very simple. Subscribe to my bi-weekly newsletter by filling in your email address in the form’s input field underneath the article. People who are already subscribed to my newsletter are automatically signed up for all competitions, but an extra Tweet or like is always appreciated! The lucky winners will be notified by email on the 23rd of July 2013. Not interested in a full license but still want to try out Visual Website Optimizer, you can now signup for a free 30 day trail.